Circle means harmony and perfection from nature, universe. Green leaf means it comes from nature, a purely natural ingredient and raw material. CIRCLEAF, a perfect native tapioca starch made from nature delivering quality, service and satisfaction to our customers. The Brand, Circle Leaf comes from values of Yee Fung and its long term goal from its team to pursue excellence. We believe the essence of our brand "Circleaf" is the quality and service consistently delivering to our customers, meeting the requirements and exceeding the expectations. With moderm advanced starch factory powered by technologeis from Sweden and Germany, CIRCLEAF brings high quality but offerable tapioca starch products to food, paper and chemical sectors. Yee Fung team, dedicated on our core business, equiped with know-how, technical experience and commitment to our customers, will be able to deliver on quality, time and cost in line with our brand Circleaf. 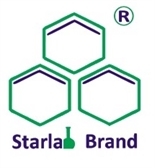 Starlab, means our modified starch product was designed and tested by 5 stars starch laboratory. We are strictly taking care of product quality with each bag of modified starch we shipped out. The brand represents stricter quality control, well manufacturing process design and management.